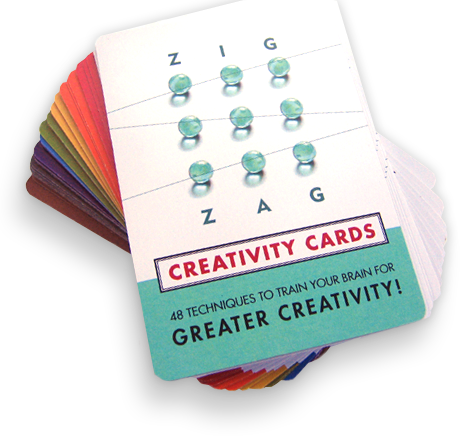 The Zig Zag card deck contains 52 techniques that are guaranteed to help you get through impasses, generate new ideas, and exercise your creative brain. You can shuffle the cards and draw one each day, or you can use the cards for solo games, group games and facilitation techniques. The cards are grouped into eight powerful, surprisingly simple steps. Each of the 52 techniques is inspired by the latest scientific research on how people create. Follow this advice, and you won’t have to wait for that mysterious moment of insight. You’ll begin to create consistently and successfully.